David Gemmell died eleven years ago, he was one of the most popular fantasy authors in the UK, a regular Sunday Times bestseller. His legacy lives on not just in the annual David Gemmel Legend Award but more importantly in the influence his writing had on the fantasy genre. I first encountered his books in the early 90's and was hooked from the start. He was one of the few authors who I'd eagerly await the next story and one who's work I would read and re-read many times. I've returned to the lands of the Drenai and the Rigante often enough to call them second homes. His uncomplicated, honest writing style and ability to weave a convincing story are unmatched in the genre. Like Pratchett and a few others, I miss not looking forward to more of his work. It was therefore something of a pleasant surprise when this book landed. While It's not unheard of for a book to be published posthumously, I can't think of many authors works have been found and published over a decade later. Rhyming Rings was discovered by Gemmells wife Stella Gemmell (also a gifted author) while going through some papers. Rhyming Rings is somewhat a depature from the authors unsual genres of heroic fantasy and historic fiction. Instead it's a gritty crime thriller set in 80's London, following the young journalist Jeremy Miller as he stumbles across the path of an ambidextrous serial killer who leaves little evidence and a growing trail of bodies. 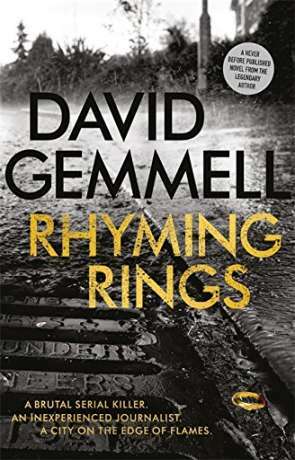 As Gemmells friend Stan Nicholls notes in his touching afterword, Rhyming Rings is somewhat autobiographical. Set in the West London where Gemmell grew up, it features a protagonist who bears a passing resemblance, working as a local journalist as Gemmell did before his writing career really took off. The book does have all the hallmarks of a Gemmell novel, intriguing characters, a clean, easy reading style that belies it's depth and above all a story that entertains. The setting of West London in the 80's works particularily well, with poverty, racial issues and looming changes leading to more tension than Trump on Twitter. The story is as much a journey of self discovery for the protagonist as it is finding the killer. The author mixes perspectives going from first to third person and back again as needed - something that requires a degree of skill to do well. The characters are a mixed bunch, from reporters to police officers to an elderly clairvoyant and retired warrior. It's an accomplished crime drama and one that sits well within it's contemporaries. Fans of crime thrillers will find a lot to love, as will fans of the author. A fitting tribute to one of the UK's finest fantasy authors. Written on 27th March 2017 by Ant.